Raising a large breed puppy is tons of fun. It’s exciting to watch the little ball of fluff you brought home double in size. Did you know, however, that growing too fast is dangerous for your puppy? That’s why many owners turn to slow growth feeding plans and slow growth puppy food to help large breed puppies grow optimally and safely. The best way to implement a slow growth feeding plan is to start early and arm yourself with plenty of information about slow growth puppy food and how it works. By the end of this article, you’ll know all about slow growth feeding plans and how to start one, as well as which brand of slow growth puppy food is the very best. What Is Slow Growth Planning? How Much Should My Puppy Grow? What Can Happen to a Puppy That Grows Too Fast? Why Do Calories And Minerals In Dog Food Affect Rapid Growth? What Is Slow Growth Puppy Food? Giant breed dogs are the kinds who observers cleverly refer with the statement, “that’s not a dog; it’s a horse!” Some of the common giant breed dogs include the Great Pyrenees, the Great Dane, and the Saint Bernard. Giant breed dogs have an alarmingly quick growth rate which can cause numerous health problems. Large dog breeds, like the Golden Retriever and German Shepherd often also face similar issues, such as hip dysplasia, though not to the extent that giant breed dogs do,. The passing of time brings progress in most things, and puppy feeding plans are no different. As canine nutrition and medical care become more advanced, a focus on how pup nutrition impacts bone development is gaining attention from researchers. Over the last 30 years, research suggests that how we feed our puppies, especially large breed puppies, impacts their skeletal development and their health when they become adult dogs. This is particularly interesting regarding large and giant breed dogs, because they are predisposed to bone problems caused by rapid a growth rate. Correlations between excess calories, calcium and other minerals and healthy bone development are accepted by most experts in the field of canine growth and nutrition. Calories and excess weight gain are the most important to watch. The good news is, the correlation between protein and growth problems has been disproven. Whether or not you monitor protein is up to you and your vet, but calories and calcium are definite concerns. Overweight large breed puppies will experience additional strain on their joints as their bodies hurry to adjust to the natural change in their size, and influence their adult weight. A surplus of nutrition is dangerous to large breed puppies since it stimulates very aggressive growth their bodies can’t adequately handle, negatively affecting your dog’s life. That’s where slow growth feeding plans and slow growth puppy food come in to save the day. By reducing the amount of excess minerals, calcium, and calories in your large breed puppy’s food, you can help him grow slow, steady and stronger. If you have a large or giant breed dog, keeping a puppy growth chart will help you effectively manage his rapid growth. It’s one of the easiest ways to track your puppy’s development. Before you make your chart, you need to know a few things about puppy development in general. Before we get into the nitty-gritty of puppy development, remember that some dogs will grow slightly slower or faster. These are general guidelines for puppy growth and development. Puppies are blind, deaf, and toothless when they’re born. Their bodily functions, like bowel movements, must be stimulated to occur. They’re pretty helpless and can’t even keep their own temperatures stable. At this age, pups live entirely on their mother’s milk. They can smell and feel but are oblivious otherwise. Puppies between 2-4 weeks of age are growing but sleeping a lot. Most of their waking time is spent nursing, as they still live entirely on their mother’s milk. During this time the pups will double in weight, which is pretty incredible. They’re eating machines and that’s ok since their mother is providing the essential calcium and nutrition they need for a great headstart. Their muscles are also developing. They become strong enough to start moving around better on their own as they get closer to 4 weeks old. They will stand by day 15 and really get moving around day 21. They can also suddenly hear because their ears open during this period of development. This makes them very curious! This is also when their teeth come in, in case you were wondering. At this age, the pups start slowly weaning from its mother’s milk and eating kibble and wet food. They are very interested in chewing this and have the teeth to do some damage. Your puppy will continue to grow for up to two years. While we appreciate a “go do it yourself” attitude when it comes to dog care, we’re here to help you! Let me provide a rundown of common markers of dog growth so you have an idea what to expect if you’re short on research time. Of course, when a puppy stops growing depends on many things, especially their breed. Every breed of puppy grows differently and your vet has the most experience to answer this question for your correctly. You can find a chart of growth in common dog breeds online to use as a guide. Generally speaking, large and giant breed dogs, like Golden Retrievers and Great Danes, will keep growing until between 18-24 months. Some will continue to grow until almost 3 years old! Small breed dogs, like the Shih Tzu, will stop growing and reach their adult weight at an earlier age. As you can see, there is plenty of time spent growing, and slowing that down a bit is good for your large breed dog. Read on to find out why. A body condition score is a bit like BMI for humans. It estimates the amount of fat your dog is carrying around. If you have a large breed puppy, you should learn how to figure out his BCS and also ensure your vet’s office understands this procedure. Monitor this score weekly using your puppy growth chart. Your goal is to maintain a score of 4/9, which may go against the suggested serving size on your bag of dog food. That’s why you need to arm yourself with some knowledge. A healthy weight is demonstrated by ribs that are easily felt but not visually noticeable and a tapered, defined waist. Using a BCS chart as a guide, perform the following examination on your puppy. With your dog standing, run your hands over his rib cage, pressing gently. Ideally, you can feel the ribs but not see them and you do not feel any excess fat under the skin. Conversely, make sure your dog’s ribs aren’t jutting out in a way that seems unnatural. This could mean your dog is too thin. Look for a tapered waist or abdominal tuck. You should see this from the front and side and also be able to feel it when you run your hands over your dog’s waist. If you have a hairy, large breed dog, you will have to go by feeling more than sight. If your dog feels bony, consult your vet as he may be underweight. The opposite is also true, so speak with your vet if you feel a lot of fat on your dog that makes it difficult to feel his ribs or hips. Discuss how you feel your dog scores with your vet. You can make a growth chart by hand or on the computer, and track your pups weight gain until they reach their targeted adult weight. Making notes on your calendar works too! Split your dog’s development into weeks and give a total growth at the end of the month so you can see both a focused and a large picture view of your puppy’s growth over time. It is also wise to perform a BCS exam weekly and jot down the score in your puppy growth chart. Use this chart to speak with your vet about how your dog is doing. You’ll have lots of facts to answer questions and get a truly specific look at how your dog is growing. If you want some additional help, there are puppy weight calculators and even equations you can use to determine how your puppy is growing. If you choose to adopt a slow growth feeding plan for your puppy, your chart will ensure you are accurately managing his progression. Puppies who are overweight or receiving an excess of calcium are at risk for DOD, which stands for developmental orthopedic disease. These orthopedic issues can include any of the following problems. Osteochondritis Dissecans is another joint condition. Adult dogs with Osteochondritis Dissecans have thick cartilage in some areas and patchy cartilage in others. Because of this imbalance, the weak points can detach from the normal cartilage which results in a flap. This flap can detach even further and eventually cause osteoarthritis. Canine hip dysplasia, or CHD for short, is sadly very common. Although this condition is hereditary, nutrition plays an important role in whether your dog suffers from the condition or not. Dogs with CHD have trouble moving around because their hips are weak or slip out of joint frequently due to a malformation in the hip socket. They may avoid stairs or running, and if the hip dislocates you will probably be able to see it. The most critical time to monitor your dog’s growth if you are worried about CHD is between 3 to 8 months, particularly up to 6 months. If you see signs of CHD, which could include any abnormality in your dog’s hind end or his gait, let your vet known right away. Breeds that are most likely to get CHD include Labrador retrievers, German shepherds, Saint Bernards and Great Danes. These aren’t the only dogs that can develop this condition, however. Dogs can also get Canine Elbow Dysplasia. Elbow dysplasia is less common, but presents in the same way as hip dysplasia, only in the connecting joint of their leg. This condition also affects large breed dogs who tend to grow fast as puppies. According to the literature from the University of Pennsylvania, this includes Great Dane, Irish Wolfhound, St. Bernard, Borzoi, Boxer, Dalmatian, Irish setter, Weimaraner, German shorthaired pointer, Doberman pinscher, German shepherd, Labrador retriever, Collie, and Greyhound breeds. Basset hounds and some terriers can also develop HO. Without getting into too much technical detail, this bone condition is painful to pets and usually presents with a limp as early as 3-4 months old. The symptoms come and go. Some dogs demonstrate pain when moving or if the affected area is pressed. Other dogs, sadly, develop depression and will even refuse to eat. Wobbler syndrome affects the cervical spine near the neck. Spinal cord and nerve compression causes neck pain and a staggering walk. It is a common issue among large breed dogs and one of the reasons experts recommend a normal growth pace for puppies. Your vet may refer to this condition as spondylomyelopathy, cervical vertebral instability, cervical vertebral malformation, or cervical spondylopathy. Over the last 30 years, a lot of research conducted sheds light on these bone conditions in dogs and how nutrition plays a role. The culprit isn’t protein, as was once suspected. Instead, minerals and calories are important to control. If your vet tells you to be wary of protein in your puppy’s food and you have a large breed dog, you should be vigilant. Politely ask for some additional reading and during your next visit, show up with some newer sources that show that protein is not the problem. Calories are your first concern and mineral content, particularly calcium and phosphorus, are next on the list to watch. You must also never free feed your large breed puppy. Calories are an obvious one. The heavier your dog is, the more strain there is on their bones and joints. Minerals are a problem because puppies are like nutritional sponges during their heaviest growth period. They can’t regulate how much calcium and other minerals they need and the more their body has, the more their system kicks into overdrive. This results in a difference in bone growth that can lead to some of the conditions discussed earlier in this post. Monitoring your puppy’s mineral intake is important to establishing lasting bone health. In addition to calcium, phosphorus and vitamin D should also be reduced in your large breed dog’s diet. If you are worried about meeting these important requirements, reach for a slow growth dog food. Slow growth dog food is formulated to address the research we’ve outlined here. The industry’s response to the concern of vets and owners makes it much easier to feed your big dog properly while meeting all of their nutritional goals. Slow growth or large breed puppy diets have controlled amounts of calcium, phosphorus, and other minerals that contribute to fast growth. Feeding your dog a large breed puppy food should keep his nutritional requirements met without providing an excess to kick his body into fast growth. Your vet may also advise you to feed your puppy an adult dog food because these foods are less nutrient dense. Choosing the right slow growth dog food for your dog is probably easier than you think. We have a few suggestions to help you get started. Many dog owners free feed their pets and have no problem. Still other dogs will eat until they nearly explode. For large breed dogs, this is not just a matter of self-control and is actually dangerous. First of all, if you free feed your large breed puppy you will never know how much they are eating. This makes a feeding schedule impossible. In the event that your puppy gains too much weight, he risks harming his joints from the strain. At the same time, overfeeding equates to a constant stream of more minerals than your puppy can handle, which we also learned can cause bone problems. So, no matter which of the slow growth dog foods you choose, don’t free feed! Measure your dog’s food and feed at specific times every day. There is a lot of talk about if rapid growth in dogs can have cancer-causing effects. After all, rapid growth as a result of hormone production can have cancerous implications in humans. It’s true that large and giant breed dogs, especially Golden Retrievers and German Shepherds, are more prone to developing cancer. However, there are a few small breeds, like the Bichon Frise, that also have higher than usual cancer rates. You don’t need to put your dog on an “anti-cancer diet” to prevent the development of mast tumor cells and cancerous growths. Instead, ensure both your large breed puppy food and adult food have lots of nutrients, fatty acids, and ingredients that will improve your dog’s life. Cancer-fighting foods are those that don’t have a lot of cheap fillers, such as corn, wheat, and soy, and include various vegetables and fruit. Whether you primarily feed your pooch dry dog food or wet food, look for real meat rather than meat by-products. Giving your dog the best, high-quality kibble possible will prevent health problems in the long run. See our full list of comprehensive food reviews for our recommendations. You know that our favorite advice at Scout Knows is to encourage you to speak with your vet before making any changes to your dog’s care and diet. The most important thing about your slow growth feeding plan is that you don’t feed your puppy too much. Therefore, any high-quality food formulated for large breeds is ok to consider. Keeping that in mind, here are some foods formulated for large dogs. Why not ask your vet about them? 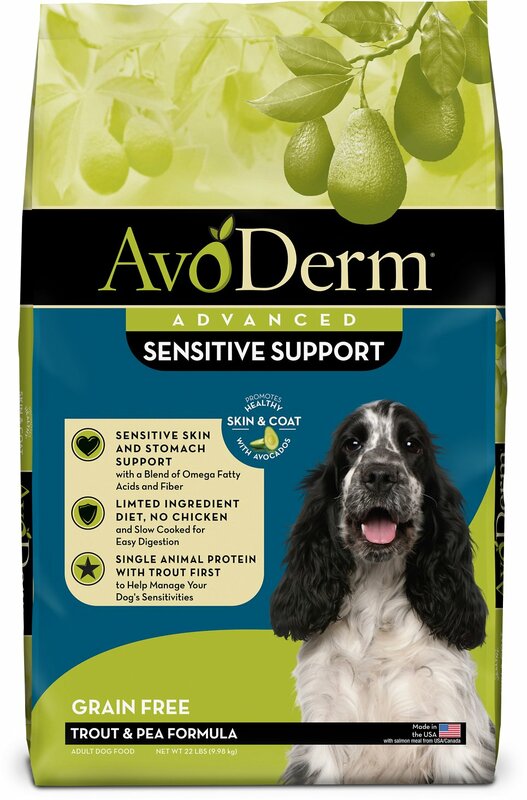 AvoDerm Natural Revolving Menu Trout and Pea is an excellent choice even if it isn’t the puppy formula. It is grain and gluten-free and falls within acceptable nutrition ranges for large breed dogs. I think the concept of this food is fantastic as well. The revolving menu encourages owners to change food often to vary protein and starch. The have several different protein-starch combos in the line that have the same formulation otherwise to minimize the potential for digestive problems. Another tactic in a slow growth feeding plan is to feed your puppy an adult dog food. 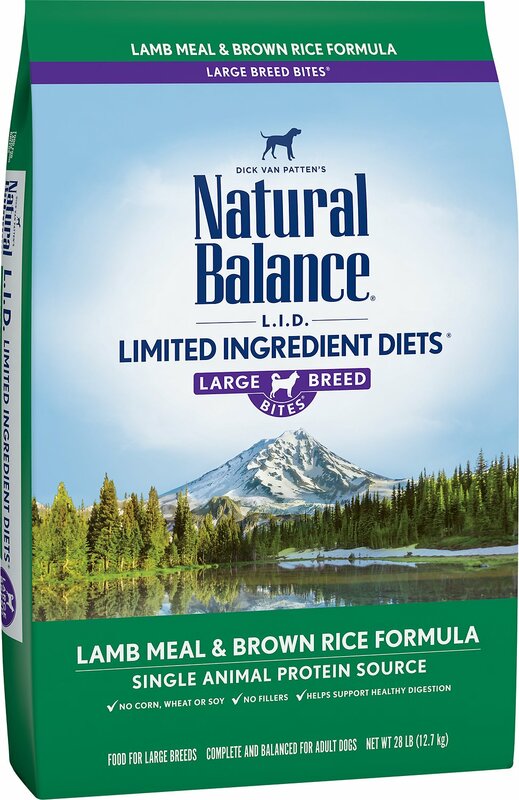 If your vet recommends this, Natural Balance is a good brand. It markets itself as a limited ingredients food to suit those concerned about fillers and byproducts in their dog’s diet. No matter what food you choose, your vet is a key partner in your quest to feed your dog correctly. If you got your dog from a breeder, they are also a good resource for information. Remember not to free feed your large breed puppy and follow your vet’s advice. You can’t always feed according to package directions blindly. If you take care, you can keep your puppy’s diet nourishing and appropriate without packing him full of nutrients. Giving just what your puppy needs will ensure he grows at the perfect pace.